 Who is Being Painted? For analysis and explanation of other important pictures from the Baroque, see: Famous Paintings Analyzed (1250-1800). Diego Velazquez was court painter to King Philip IV during the early era of Spanish Baroque art (1600-1700). Although noted for both his history painting and genre-painting (bodegons), he is best-known for his portraiture - completing over 20 portraits of the King along with others of the Royal Family and their friends. Spanish painting of the period was blessed with numerous virtuosi, including El Greco (1541-1614), Francisco Ribalta (1565-1628), Jusepe Ribera (1591-1652) and Zurbaran (1598-1664), but Velazquez rises above them all, and - since the 19th century at least - has become recognized as one of the greatest Old Masters of Spain. Las Meninas is Velazquez' most complex masterpiece of Baroque art, outshining all his other famous works including The Waterseller of Seville (1618-22); Christ on the Cross (c.1632 Prado), The Surrender of Breda (1634-5, Prado), or Portrait of Pope Innocent X (1650, Galleria Doria Pamphilj). It is a fascinatingly modern painting, a mixture of realism and non-realism. Originally entitled "The Family of Philip IV," Las Meninas depicts Velazquez himself working in his studio in Madrid's Royal Alcazar Palace. The setting is the cuarto bajo del Principe, the apartment once occupied by the crown prince Don Baltasar Carlos (who had died in 1646). After his early death, Velazquez took up lodgings there. On the walls we see copies of several works by Rubens, including, on the rear wall, Pallas and Arachne and The Judgment of Midas. 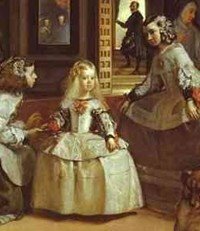 The picture is composed like a scene from a play, with all the actors in their pre-planned positions, around the central blonde figure of the five-year old Infanta Margarita Teresa (1651-73). The daughter of Philip IV, King of Spain, and Maria Anna of Austria, she married Leopold I, becoming Holy Roman Empress, but died prematurely at the age of twenty-two. The actors in the painting include (from left to right): Diego Velazquez who stands behind his huge canvas, painting the scene; Maria-Augustina Sarmiento, the first lady-in-waiting (menina), who offers water to the future empress; the Infanta Margarita; Isabel de Velasco, the second lady-in-waiting, who curtsies; and the two female dwarfs - Maribarbola with her battered face, and Nicolas de Pertusato, who teasingly kicks the sleepy dog lolling on the floor. In the shadows behind them is the ladies' governess Marcela de Ulloa, and an usher; standing in the open doorway is Don Jose de Nieto Velazquez, the marshal of the queen's palace, who draws aside a curtain through which light enters, gently adding to - and competing with - that from another source, an unseen window on the right. It is a fairly complex scene, and one which some art critics believe is more like a genre painting than a portrait - after all, who is Velazquez painting? It is surely not the Infanta: he scarcely casts a glance at her, any more than he does at the ladies-in-waiting or the dwarfs. At what or at who is his glance directed, and what are the Infanta, the attendant, and the tiny woman gazing at? They are all looking to the front, towards something beyond, or rather at something outside the image field, which can be identified if we pay attention to the mirror hanging on the rear wall (left-centre), in which we see the reflections of the King and Queen of Spain. This is highly reminiscent of the Arnolfini Portrait (1434, National Gallery, London) by Jan van Eyck (1390-1441), which also employed a mirror to reveal something lying outside the image field. The same device is used quite differently here, however. The object represented in the mirror is in fact the real subject of the picture. So the artist has painted a picture of himself painting a portrait of two people, whom we cannot see, but whom are watched by their family and servants. It is this mixture of reality and illusion that makes Las Meninas one of the greatest portrait paintings of the Baroque. Notice how Velazquez deliberately confuses the viewer by creating tension between the two rectangles at the centre: the deflecting figure of Jose de Nieto in the open doorway, and the reflected half-figures of the king and queen in the mirror. Velazquez painted directly, without drawing first, without 'calculating', as it were. He began with the brush, sketching with a burnt umber, going from dark to light often alla prima ('wet-on-wet') (an oil painting technique in which layers of wet paint are applied to existing layers of wet paint) often finishing in one session - as he did with the Portrait of Francesco ll d'Este, Duke of Modena (1638, Galleria Estense, Modena), or the Portrait of a Man (1649, Apsley House, London). In many cases, of course, he was unable to complete a painting in one session, but often, even in Las Meninas, he managed to finish most of the figures alla prima, and later retouched here and there. Velazquez's use of colour is guided by his awareness of the differences between cool and warm colours, and the possibility of modifying hues by contrast. Thus he rarely used primary colours, and instead of using a brilliant red, preferred to create an optical illusion of it. A good example of his approach is the red ribbon in the dress of the Infanta Margarita. The pigment used by Velazquez is not vermilion, as one may think, but red ochre. The bright red colour we see comes only from the contrast: both the cool grey surrounding it and the point of yellow in it magnify the redness, and so transform red ochre into something much redder. On the other hand, vermilion was used, mixed with white, in the Infanta's face to produce the cool light pink of the cheeks. In this masterly chromatic modulation, visible in his mature and late paintings, Velazquez let himself be carried along by his inner voice, which he may have perceived as his source of truth. The wonder is that a king could have perceived its greatness. The general public, however, had no access to the Spanish royal collections, and so Velazquez remained private until the opening of the Prado Museum in 1819. Since then, and particularly in the 19th century, his work has had an enormous impact - most notably on Edouard Manet (1832-83), who was himself one of the great modern artists of his day. The meaning of Las Meninas is far from clear. Velazquez was official portraitist to Philip IV (1605-65), who ruled Spain between 1621 and 1665, during the difficult period of the Thirty Years' War. Philip was married twice: first to Elisabeth of France (1602-44), and after her death, to Mariana of Austria (1634-96). So the royal couple whom Velazquez was painting in Las Meninas was Philip and Mariana. Unfortunately, their marriage was not a happy one. This was due to the 30-year age difference between them, Philip's infidelities and Mariana's excessively pious nature. Added to these concerns was diplomatic problems with Austria as well as hostility from England's ruler Oliver Cromwell. So the Spanish court was not an especially happy place when this picture was painted. The key question is: why did Velazquez distract attention from the king and queen? Why are they confined to blurred images in a mirror at the back of the room? Most experts seem to think that Velazquez was highlighting the difference between the illusion of art and the reality of life. (Obviously as official painter to the leader of fundamentalist Catholic Spain, he was in no position to advance the anti-religious view that life itself is an illusion.) This had been a feature of at least two of his other paintings - the Rokeby Venus (1647-51, National Gallery, London), in which the face of the subject is blurred beyond any realism, in a mirror; and Christ in the House of Martha and Mary (1618, National Gallery, London), in which Christ and his companions are visible only through a serving hatch. Alternatively, Las Meninas might be seen as a summary of Velazquez's life and art up to that point. It contains his only known self-portrait, which he places in a room surrounded by royalty, courtiers, and precious objects that appear to represent him and his milieu. Was he claiming high status for himself and his art by association with royalty? If so, why not simply paint himself into a group portrait of royals - something he did not ever do?  Apotheosis of St Ignatius (1688-94) by Andrea Pozzo. Jesuit Church of Sant'Ignazio, Rome.  For an explanation of more of the best Baroque paintings, please see: Homepage.